I read with interest the news story of the three young students (two Dutch and one British) who on finding themselves stranded in Turkey for eight days, survived by eating insects. I thought the piece was interesting not for the regaling of the student’s survival plight but that the headline focus on insect-eating implied this was the real shocker of the incident. One thing I’ve never been afraid of is trying new foods. I remember my parents being impressed enough to tell all their friends (one of whom’s children had spent several years only eating baked beans, smash and chocolate mousse) that I had eaten squid kebab whilst on a family holiday, when I must have been about eleven or twelve. To me it wasn’t that big a deal but after that I probably reveled in and strove to live up to my reputation as a gastronomic dare-devil. Like most people I do judge edibles on how they look and allow appearances to affect what I think of certain questionable foodstuffs, but preconceptions wont stop me from trying these. So I’ve never really understood why people are squeamish about eating certain things. 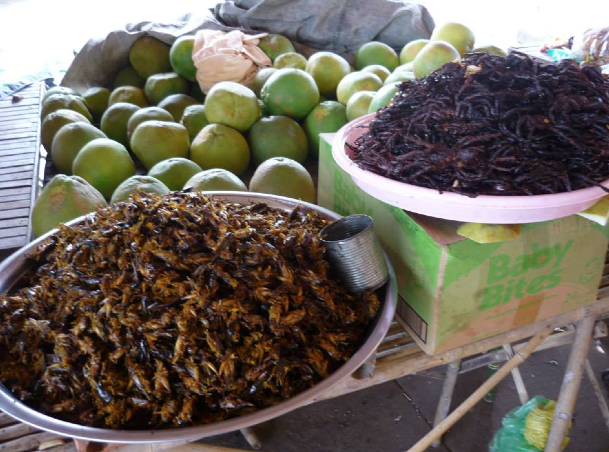 When I was in Cambodia in the summer of 2013 (gosh, that sounds so much longer ago now that it’s 2015), the guidebook I read in advance informed me that fried tarantulas were a common snack and that insects were often on the menu. The though of eating creepy-crawlies was definitely a bit weird, and still is, but I’m not really sure why. Yes, they are a bit gross to look at with sticky-out eyes, feelers and too many legs but prawns are just as disgusting and have you ever really looked as a mussel as you are eating it? Yet these sea-insects, if you will, are eaten by many who would be horrified by the thought of eating crispy noodles with red tree ants or a nice bowl of fried crickets. Eating bugs is definitively a cultural thing and I suppose that because, unlike prawns and mussels, they are so readily available in the dirt around us this makes them less desirable in the way that caviar is probably valued more for its seeming rarity. Eating insects is also often associated with poverty and starvation and that might be where part of our preconceived distaste comes from. Generally my food-philosophy is to try anything once and I wouldn’t automatically turn my nose up at any local cuisine whether that’s frog’s legs in France, black pudding (congealed pig’s blood) in England, paella with prawns and mussels in Spain, fried tarantulas and snake in Cambodia, Chicken’s feet in China or a Matcha Green Tea Latte in Geneva. I’m not committing to liking these things but I’m definitely willing to have a go. Actually all of those items above I have tried (although not necessarily in stated country) and the only thing I thought truly vile was the Green Tea Latte I ordered this week but even that I still managed to slurp down, albeit shuddering with every mouthful. I wont order that one again. I’m often motivated to try new things by the fear of missing out on great opportunities if I shut myself off to these. 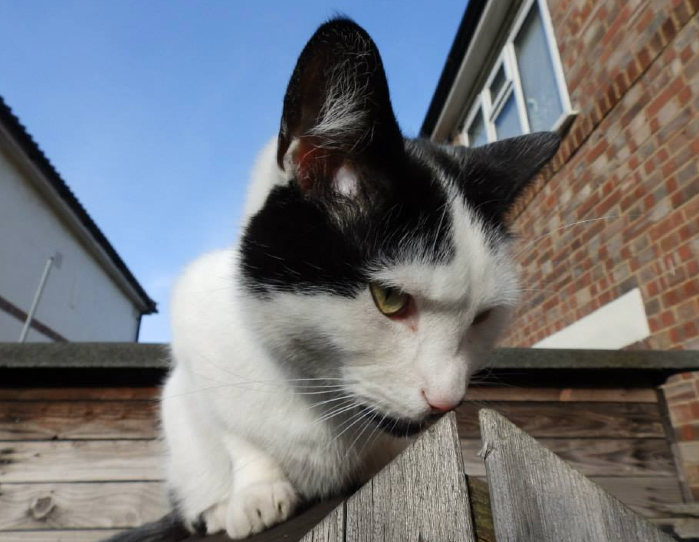 And from experience I know that whilst every activity is not necessarily for me there have been things I’ve tried without enthusiasm that have positively astonished me. If I’m honest I find snorkeling too scary to actually appreciate. But volunteering to run sessions of a legal programme for teenagers, that I thought I would struggle with, I really enjoyed. In the same way I wouldn’t want to miss out on cultural culinary opportunities that might amaze me. 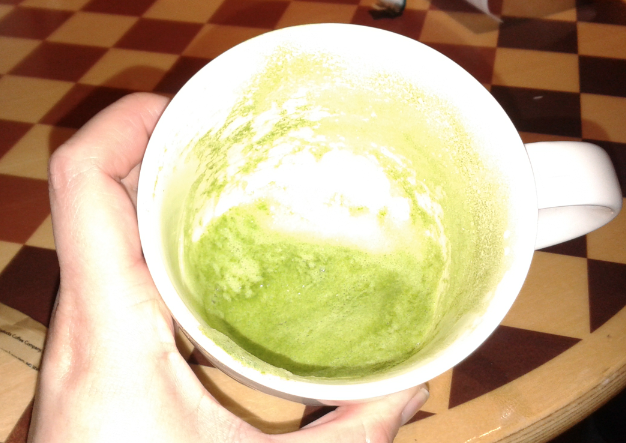 I like green tea but thought the green tea latte revolting. I am pathetic around living specimens but found fried arachnid legs rather tasty. I love travelling, and hope to do a lot more of this, but what I really enjoy is attempting to get under the skin of a different culture to find out what makes people from that part of the world tick and to think about how they live the lives they do. I know you can’t generalize whole people from brief visits to a place but you can at least try to get an understanding of certain similarities these people may share. When I went to Thailand about a decade ago I saw fried locusts for sale in busy tourist areas but declined to try them, partly because I was less brave than I am now but mostly because I wasn’t convinced that this was something real Thai people ate. I thought the eating of locusts might have just been a touristy gimmick with locals snickering from alleyways at the foolish farang. However in Cambodia, at a local party celebrating the official opening of one of our favourite hostels/bars, we were enjoying the cheaper-than-water-beer when out came steaming dishes of crispy once-jumping hexapods. As the Cambodians there started tucking in I recognized the legitimacy of the dish and knew I would have to participate. The locals watched us expats with interest to see how we would respond to the unfamiliar platter and their curiosity was amply rewarded by the looks on our faces as we braved the many-legged snacks. But actually, once we got over the strangeness of eating a food so foreign to us, we enjoyed these little critters, which a friend accurately described as meaty crisps. I wonder if those stranded students came to like their bug-based diet, once they allowed hunger to overcome initial misgivings? More likely their having to eat insects as necessity impaired their ability to truly appreciate these. I hope their ordeal will not indefinitely put these young adventurers off from future expeditions and perhaps they will even have the occasion to sample some intriguing local cuisines prepared in more favourable circumstances.